New Job Messages for when someone you know lands that big job! Your new job sounds like a perfect fit. Wishing you great success and happiness. Good luck! That standing ovation you hear is me! Congrats on the new job! 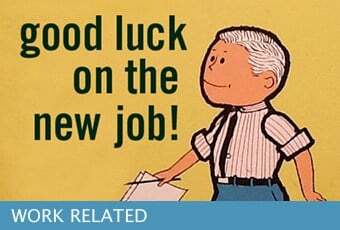 May you find great happiness and success with your new job. You were too good for this place! Congratulations on moving on to greener pastures! It was a fantastic experience to have worked with you! It’s a celebration! Job well done! Congratulations! I know you will never get this promotion without your perseverance and self-discipline. You are such a good model for people around you. Congratulations! You’re now at that next level. Keep up the good work and always do your best! Missing you already! Good luck! We’re so freakin’ proud of you! Good luck with the new job. I hope you really enjoy it! Thanks for all the laughs and memories over the years. Wishing you all the best with your new role! The journey is the reward. Enjoy! Dare I say this is a drinking occasion! Congrats! This comes as no surprise. You deserve it! Congratulations! Congratulations on your promotion! Hard work truly pays off. We wish all the success on your path to world conqueror! Parting is such sweet sorrow! May you find all the happiness you deserve in your new position! Good luck with the new job and your career aspirations.